"One more order, Mister Bligh, and I'll have your head on this deck, by heaven I swear it." Charles Nordhoff and James Norman Hall's classic Bounty trilogy has been adapted three times, most notably in the 1935 version starring Charles Laughton and Clark Gable and most recently in the 1984 Mel Gibson version. Between the two falls this rather bloated and self-important roadshow extravaganza, which despite its many failings does have some striking moments. As usual, Captain William Bligh (Trevor Howard) has a two-year mission from 1797 to 1799 to sail to Tahiti, obtain a thousand breadfruit trees and take them to the West Indies to provide food for the slaves on the sugar plantations. With the help of first mate Fletcher Christian (Brando), Bligh keeps a tight ship using starvation and flogging to cow his men and break their spirit. After a brief respite in Tahiti, the crew has had enough, and led by Christian they seize the ship and set Bligh adrift in an open boat. But where can the mutineers turn when they face hanging at every civilized port? This version is oddly enough told from the perspective of a gardener from Kew Gardens, William Brown (Richard Haydn) along on the voyage to make sure the breadfruit trees manage to stay alive. Brown makes for an imperfect narrator since much of the tale involves matters that he's not present for and that he'd have no occasion to learn, but at least he represents us landlubbers aboard the boat�I mean ship. The structure is rather forthright, though as originally shot it was a massive flashback bookended by an 1814 prologue and epilogue that were snipped before release (these appear in the extras section). That was probably a good decision, since the dramatic effect of the finale (never mind that it has little historicity), especially the pan from the weeping Maimiti (Tarita) to the burning ship, would have been much lessened by a concluding tag. Trevor Howard's portrayal of Bligh is an interesting one; rather than the strict and greedy Bligh submitted by Laughton, his version is primarily a bundle of sexual repression. Howard's Bligh is unwilling to enjoy the physical pleasures of Tahiti, while he takes an ecstatic pleasure in severe chastisement of the crew, including bloody floggings and illegal keelhaulings. Brando's Fletcher Christian is certainly novel, if nothing else. Playing him as an effeminate eccentric given to odd headgear and a mincing attitude, he moves him as far from Gable's manly man as possible. While it starts off rather absurd, at least the portrayal does have the merit of triggering his mutinous sentiments by setting up his easily offended sensibilities. One does wonder exactly how such a character managed an appointment as a naval officer in the first place, however. What really drags the picture down is the seemingly endless Tahiti interlude. It's rather tedious and although director Lewis Milestone tries to inject some action, it's just impossible to make paradise very interesting. The tightly-glued leis are rather humorous and nearly as repressed as Bligh, which provides a comical juxtaposition to the sensuous dancing. This was Milestone's last feature film in a lengthy career that stretched back to World War I, and it does demonstrate flair at times. Chief among these are the memorable sequences of Bligh, cast off in his longboat, with potted breadfruit trees cascading down around him on every side, and the finale as the Bounty burns. The effects work is generally excellent (though a few shots of the flames on the miniature Bounty are obviously in the wrong scale), and verisimilitude is certainly helped by the fact that the film's Bounty was an actual sea-going ship, built for the occasion in Nova Scotia by hand and sailed to Tahiti for shooting. The art direction as a result has plenty of authentic-seeming detail and the ship has a feeling of being lived in by a crowd of men. But the three-hour running time and limp pacing makes this picture difficult to sit through, and there's not enough of interest to make the effort worthwhile. The presentation does include the Overture, Intermission and Entr'acte music from the roadshow version. Image Transfer Review: Originally presented in 70mm Ultra Panavision, the very wide large-format image was reduced to 35mm for the HD transfer, and it looks excellent, with vivid detail of Portsmouth Harbor and aboard the ship. Movies with sailing ships are always problematic on DVD due to aliasing issues on the rigging, but the omnipresent ropes at every conceivable angle are rock solid here, with no jagginess to speak of at all. The sea and sky look utterly gorgeous; one can virtually smell the sea air. Black levels are excellent and the many shades of green visible in Tahiti make the standard version look rather drab. Edge enhancement is quite limited and the picture is very satisfactory. Audio Transfer Review: The 5.1 DD+ mix has a nicely enveloping sound. Bronislau Kaper's bomastically Wagnerian score has excellent range and immediacy throughout. Dialogue has some moderate directionality without being distracting. During the Cape Horn sequence, the thunder of the waves is overwhelming, with plenty of low bass and LFE boosting it along. Extras Review: The most prominent extras are the deleted prologue and epilogue, which previously were seen only in a 1967 television airing and have never surfaced since. There is a nonanamorphic widescreen trailer, as well as trailers for three other Brando releases. The balance of the extras are copious, running well over an hour, but are rather disappointingly narrow in focus: they are almost entirely devoted to the ship seen in the movie and there is precious little to be gleaned about the picture or its making beyond that. After the Cameras Stopped Rolling (24m:16s) takes a look at the ship after the movie concluded and the efforts at its preservation. The vintage documentary Story of the HMS Bounty (28m:35s) relates the construction of the ship, while Voyage of the Bounty to St. Petersburg (24m:33s) covers its maiden voyage to Florida from Nova Scotia. Tour of the Bounty depicts the North American leg of the ship's post-filming promotional world tour, and a promo (6m:59s) specifically covers its appearance at the 1964 World's Fair. Ship lovers will be delighted, but anyone looking for insight into Brando's involvement, Milestone's technique or pretty much anything else is left empty-handed. 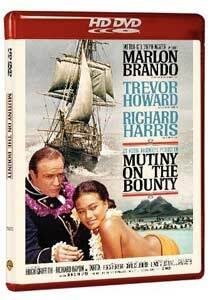 An intermittently interesting take on the Bounty story, though it sags badly in the overlong Tahiti section. Fans of the picture should be very happy with the HD rendition, however.